The former tea party darling is booed at a conservative conference in his home state. Amnesty for illegal immigrants and illegal aliens, like obama, is incontrovertibly, irrefutably, blatant 100% high treason. We already HAVE a legal path to citizenship! The problem is that many refuse to follow it, demanding special priviledge ahead of all those who respect and obey our immigration, income tax, auto insurance, election and other laws! Good for the conservatives…Rubio needs to wake up, FAST! He’s going to destroy his future as a (R)! Rubio, you need to start thinking (Defensively for America!). America comes FIRST! Not the 3rd world. 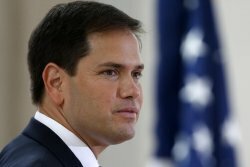 If America doesn’t survive, Rubio, how do you think anything will ever get accomplished after that? They can’t (or won’t) even enforce the laws that are in place now. Why do we need more laws that are just paper. Finish the fence. Every congressman supporting amnesty should take a bus ride to the Mexican / Texas border and see what really goes on down here. How can Paul Ryan support this when the only border he’s ever seen is Canada? Plus there are so many Americans without jobs – why bring in others to compete for the very jobs that are available. This entire amnesty issue needs to die a quick death.